The identity assurance service will allow users to sign in to government services and prove their identity quickly, safely and privately. Today an important part of the service, the 'hub', was completed and is ready to go into beta. The hub will manage communications between users, identity providers and government service providers. It will allow users to select and register with an identity provider, and then use their assured identity to access digital services. Initially we will be connecting the first of our identity providers and testing that users can prove their identity to a mockup of a government service. Once we’ve done that we will connect our first ‘exemplar’ government services and run further small scale tests before rolling out the full service. Throughout this year we’ve been developing, testing and improving the identity assurance service with users, identity providers and central government exemplar services. And we’ll continue testing and improving for the life of the service. We have also been working on alpha projects with local authorities and other commercial organisations to learn more about certain aspects of the service and explore possibilities for future uses of identity assurance. Our first identity providers are currently going through a series of tests (or ‘gates’) to check that they can meet their contractual obligations. These gates are checkpoints in the development of the identity providers’ service which will need to be passed in order for them to participate. The identity providers will also need to be international standards (ISO 27000) compliant and certified by an independent, certification organisation (tScheme) as meeting the identity proofing and credential management requirements set out in our Good Practice Guides. If the providers fail to pass the gates or not achieve certification, they will not be able to offer a fully live service. This means that users can be assured that the identity providers they are offered have been through a very rigorous process of quality and security control. Also, that government services can be assured of the standard of identity proved. Today is an important day in the development of the identity assurance service. The foundations are complete and we can push on with building the live service. There have been many challenges along the way, not least identifying and consulting on appropriate Privacy Principles and adhering to the strict service standards. We will continue to work extremely hard to create the best possible service and experience for users. If you’d like to know more or have any questions, please respond to this post. 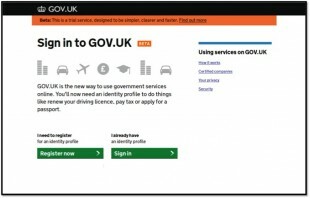 When I sign in to gov.uk do I have to exchange a username/password? If I do, where are those credentials stored? How can members of the public try out the public beta? Thanks for your question, Tom. We'll be starting in private beta with a controlled audience chosen by the first departments to use the service. For example, HMRC will trial their PAYE online transaction service using selected organisations. You'll be able to try the service once it goes into public beta. Dates will be announced on this blog and by the departments offering the service. As an ordinary member of the public I find this information completely incomprehensible - absolute management gobbledegook. It looks to me like a disguised rehash of the discredited identity card system. Thanks for your comment, Carol. We're planning a series of posts over the coming months that will explain the service in more detail. If there are particular things you think we should cover, please let us know. Dear sir/madam, my wife will shortly be using this service to transfer some of her unused personal tax allowance to me.Can she still use the verify service if she does not have a credit card and we do not have a mortgage as the email from register for Marriage Allowance has implied might be needed? Can she not use a statement from our joint bank account or council tax account or utilities account for verifying purposes? Hi Alexander, thank you for your comment. Whichever certified company your wife chooses will perform some checks before verifying her identity to GOV.UK, such as questions about your wife’s financial information only she would know the answer to. Your wife may still be able to verify her identity using GOV.UK Verify, even without a credit card or mortgage. GOV.UK Verify is currently in public beta - this means that we are constantly updating and improving it based on user feedback. We are aware that a lack of credit rating can cause difficulties when trying to use GOV.UK Verify and are working with the certified companies - including 5 new ones that will be available for you to choose from in the coming months - to expand the range of available data sources to address this issue. Since I spoke to you last my wife tried to get verified with no success with 3 of the certified companies. It seems that as she has no recent credit history it is causing problems to get verified. Is there any progress to make it simpler for folk like her. Perhaps getting verified the old fashioned way i.e. by post might be a way forward? Sorry that GOV.UK Verify isn’t able to verify your identity at this stage. A HMRC advisor will be able to verify your identity and take your wife's application by telephone.